You can do spike with bgmapper?! Ugh, I should have tried that ages ago, how embarrassing. 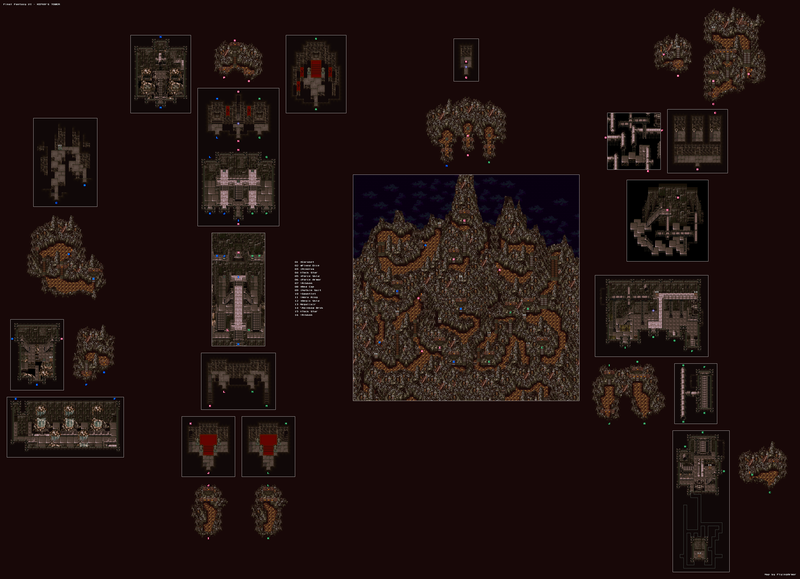 I finally got around to adding all the labels to the Kefka's Tower map yesterday, so the final dungeon is at last complete! The Lete River's all that needs to be tackled before this map set can be considered truly complete. I managed to finish it off just now. XD I finally figured an effective way of viewing all the inaccessible areas you wouldn't normally see while traveling on the raft. 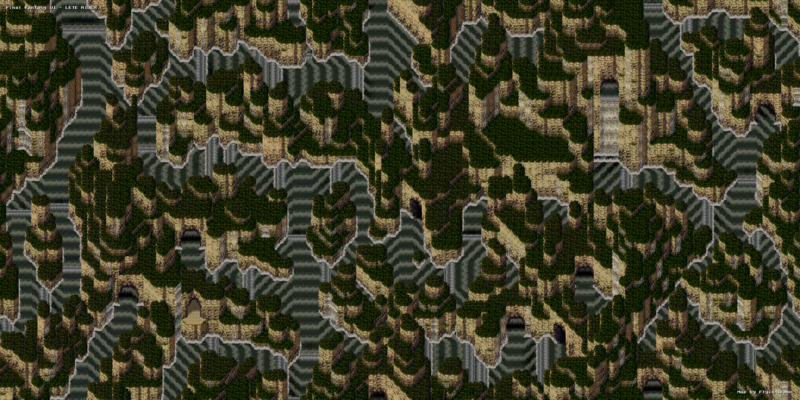 I will probably revise it to include the caverns with the save points at some point, but for now I'll leave it as it is. Hey all, just thought I'd update this thing with some of the new things I've been up to. First of all, I decided to revise all my Paladin's Quest maps to reflect the style of mapping I've been doing since FF6. This means that many of the items that can be found in houses and buildings that weren't included before will now be documented. I've revised about twenty maps so far. Next off, I've been mapping the Japanese version of Final Fantasy IV. I have most of the overworld locations mapped thus far. All the labels and items will be in Japanese, so that shouldn't deter people from doing their own maps for the English version (perhaps Locke_gb7 will resume work where he/she left off?). Lastly, I have been working on Dragon Quest V for the last few months, pretty much ever since I finished the game. I think I have roughly 80% of the areas mapped so far. I don't think I will bother labeling them in English though, so if there is anyone interested in doing that, please let me know and we can work out an arrangement. And as a little aside, I'm just about finished with playing God Medicine for the Game Boy, and wouldn't mind mapping that game some time in the future too. Here are two examples of how I will be handling the Dragon Quest V maps. For the map titles, I will be leaving them in English. However, I will be using the original Japanese names and simply translating them into English as best I can. The DeJap translation did a pretty good job of that, though there are a few tiny details that I would change for my maps (eg. "Santa Rose" instead of "Santa Rosa", the original Japanese being ã‚µãƒ³ã‚¿ãƒ­ãƒ¼ã‚º). Just as an aside, the DS version really took great liberties with the names, two striking examples being Salabona ending up as Mostroferrato, and Evil Mountain being changed to Mount Zugzwang. For the contents of treasure chests, I will keep them in Japanese. I want to be able to label the chests directly, and the Japanese names best afford that since they are at most only eight characters long. Take for instance "Lamp of Darkness" v.s. ã‚„ã¿ã®ãƒ©ãƒ³ãƒ—. There will be a few instances where a legend will be in order (when a lot of chests are clustered together), but for the most part, those instances are few and far between. I would suggest a table off to the side of any map with Japanese names for the contents of chests that would translate what is in the chest to English. Yeah, that would probably be a good idea, especially if I'm gonna be submitting them to an English website, right? I guess I'll think of a way of incorporating something like that in somehow. Kewl, I must say I also like your choice in labels. They are small so they don't cover up much of the map and the color stands out and is easy to see without hurting the eyes. Ah, thank you! Glad you like 'em. I'm sure you'll like the ones I added to these two recently completed Lennus II maps I worked on today (might as well post them since they're done). I've had the actual areas mapped for a LONG time, but just now have I bothered with labels and formatting. Feel free to add these to the site anytime, Jon. I'd just like to ask about people's thoughts about the stairway labels on Al Rouge. Are they easy to read? I added borders to make them stand out more than if they were simply the letters by themselves. Yes, I think the labels for the stairs stand out well and are easy to find and read. In fact, those stairs don't look much like stairs at all so having labels that stand out is, in my opinion, necessary. Okay, that's good to hear. The only worry I would have later on would be if the labels go on to the letter O, since it looks very similar to the letter D in that font. But I don't think all that many maps would go that far with stairways and doors anyway (I don't think, it's been a while since I last played this game) so perhaps it's just a meaningless worry. @TerraEsperZ: Now that you mention it, they do blend really well into the scenery, don't they? Just finished off mapping the first town for Lennus II. I'm not sure if the four items I labeled are all that there are in the town, but I can always revise it later if I discover more. I just noticed you're using transparencies for the labels and that makes them look even better . Thanks. I'm glad you think so. I think transparent labels look really nice with games that are more sophisticated graphically, in contrast to say, NES or early SNES games. I think I might try experimenting with my Dragon Quest V maps to see if they'd be aesthetically pleasing in that game as well, though I imagine more opaque labels may be more appropriate for that particular style of artwork. We'll see I guess.